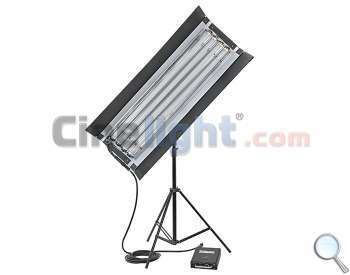 CineLED Box 4FT 4Bank 160W [SHD-LIT-003] - €40.00 : Shadeena Rentals - The more you rent, the less you spend! The CineLED Box 4FT 4Bank combines all the benefits of LED technology with the most common fluorescent light design used on big productions studios. The CineLED Box 4FT 4Bank fixture provides soft, flicker-free light like a bounce-source. The built-in barndoors and the included louver help shaping the light spread and also protect the LED tubes during transport. The CineLED Box consists of the 4FT lamp housing with wiring harness and reflector, the Bi-Color LED tubes and the external dimming & DMX ballast. The main advantage of using this type of light is given by the 4 FT Bi-Color LED tubes relative to the traditional fluorescent lamps. The LED tubes are significantly less fragile than the fluorescent lamps due to their unique construction: aluminum shell with "milk" (very soft) diffusion cover. This type of housing has the advantage of maintaining the same light characteristics as the fluorescent tubes. The expected life time of the 4FT LED tubes is 25 times higher than on the Kino Flo True Match lamps (50'000 hours of continuous use instead of 2000 hours) that translates to significant savings when using the CineLED Box. Just multiply 25 lamp changes with the cost of a single fluorescent lamp and the price difference will be noticeable. Above all, the 4FT LED tube has both 3200K and 5600K LEDs in one housing that can be switched and combined by a single push of a button, eliminating the elaborated process of re-lamping the fixture to change the color temperature. The high CRI (90 Ra) SMD LED tubes provide a flicker-free experience at high speed rates (studio tested at 3000 fps). Also, the 4FT LED lamps draw less power than a fluorescent lamp (40W instead of 75W) while providing a higher light output. The external ballast with integrated DMX digital controller is manufactured from high quality components with great performance and durability. The built-in digital display shows the brightness values and the DMX address and allows the user to save different lighting presets. The built-in dimmer control helps dimming the light output from 100% to 0% while maintaining a constant color temperature. The CineLED Box 4FT can be powered from external batteries using the BVCU adapter when shooting in locations with limited or unavailable AC power source. The CineLED Box 4Ft housing is made from polycarbonate and has reinforced ends, making it resistant to the everyday use on the set. The fixture itself is lightweight enough to be taped on the wall so handling this type of light shouldn't be a problem to no one. Sharing the same construction design as CineFlo / Kino Flo 4FT 4Bank, the CineLED Box 4Ft 4Bank fixture housing, harness, cables and accessories are cross-compatible. - Cross-compatible with CineFlo / Kino Flo fixture, harness and cable.